Texas scenic drive, Devil's Backbone, RR 32. From San Marcos follow RR 12 west of to where it connects with RR 32. The road runs the crest of the ridge called the "Devil's Backbone". An unusually scenic drive, you will pass several roads leading to Canyon Lake. After 33 miles you will intersect with Hwy 281 - just a few miles south of Blanco. 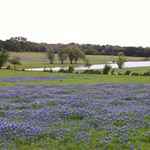 From Blanco, FM 1888 west will take you to Luckenbach. Follow the signs on FM 1376 a short drive north to Frederickburg. It was deer hunting season in Hays County. Four of us hunting on the D Ranch decided to stop for a beer on Ranch Road 32 otherwise known as the Devils Backbone. The name is partly because the road follows a local mountain chain. What happened during this time frame was very much like a step back into the then popular TV show of Rod Serling's Twilight Zone.